ANGELO FICHERA TTN Protesters take to the atrium after Bill Clinton’s visit was canceled. Occupy protesters targeted students when a political event on campus was canceled. As wet snow lined Philadelphia grounds Saturday, Oct. 29, Occupy Philadelphia protestors marched to Main Campus to sit-in at an event featuring former President Bill Clinton. But when their message couldn’t reach politicians, they turned their attention to students. The rally, scheduled for 2 p.m., was intended to support Mayor Michael Nutter’s re-election campaign. Clinton reportedly could not make it to Philadelphia due to weather, which left Occupy supporters to seek another public venue. The protesters, who intended to silently sit in at the rally, went to Mitten Hall, unaware of the cancellation. They then traveled to the Student Center, only to find the entrance blocked off by police officers. While the group then set its sights on Paley Library, they were later told they had received clearance to enter the Student Center. Taking to the atrium, the protestors chanted in support of the movement and against student loan debt. After the short meeting, some protestors, including student-occupiers, took to the dining area on the north side of the first level in an attempt to garner more student participation. The small group of protestors began speaking before the whole dining area, before visiting individual tables to speak to students about the movement. Freshman mathematics major Cameran Allavi said Murphy’s visit to his table educated him and his friends on the movement. Adam Shumski, a freshman jazz performance major, agreed with Allavi’s sentiment. Murphy said most students are usually skeptical and cynical when he first approaches them. 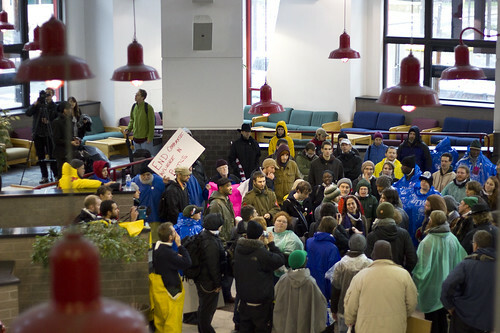 It wasn’t the first time Occupy supporters demonstrated on Main Campus to garner support. On Oct. 21, a walkout and rally at the Bell Tower was held before students marched to City Hall, the site of Occupy Philadelphia’s encampment. But Saturday also highlighted the idea of acute weather forces and cold temperatures impeding the Occupy movement. Alford-Fowler said the hardest thing, in terms of severe weather, is sleeping outside. She added that protesters are beginning to “weatherize” the camp by doing things such as raising tents. While Alford-Fowler and Murphy agreed that weather may prove to an opposing force, they said the Occupy movement is no longer just physical. Ditch the mayo, and grab a slice of the whole grain bread; the right choice can go a long way in keeping off extra pounds. Great reporting, Angelo. I’ve been talking to the major press and telling them for weeks now to go talk to individuals to find out that the movement may be non-political, but the individuals and their concerns are not. I’m glad to see someone took the time to figure that out.